When you think of Maine you probably think of lobsters. And why not, the tasty crustacean is plentiful in the state. 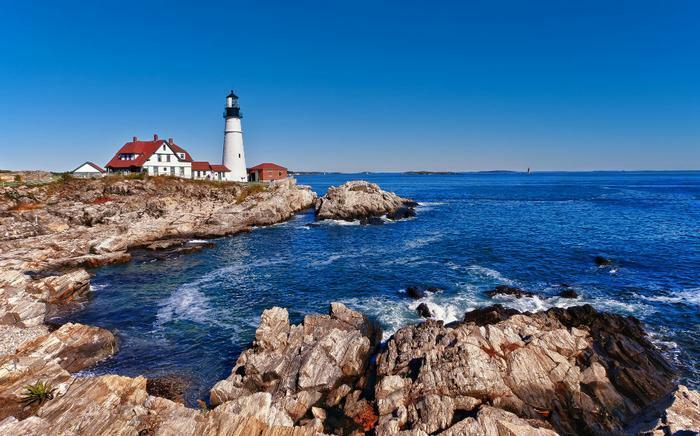 But Maine is a whole lot more than lobsters, and its location on the Atlantic, next to the Canadian border, attracts travelers from warmer climes during August. While outdoor activities in southern states might be a bit unpleasant this time of year, travelers flock to Maine, largely for the great outdoors. And the pleasant climate. The average high temperature in Portland, Maine in August is around 77 degrees. Maine's Midcoast and Islands region is a mountainous area that offers plenty of hiking trails and ocean views, usually from the same spot. It's home to the towns of Belfast, Camden, Rockland, Wiscasset, Brunswick, Bath, and Damariscotta. Bath features the Summer Gazebo Concert Series, with jazz and traditional band concerts in Library Park, every Tuesday and Friday evening through August 28th. In fact, many of the towns and villages celebrate the arts with music during the summer months. The city of Portland, along Casco Bay, is a hub of arts, entertainment, and dining. Restaurants in the area have racked up a number of awards in recent years. Bon Appetit has given the city the title "America's Foodiest Small Town." Old beach towns lie along the coast just south of Portland, known for their dining as well as their spectacular views. Earlier this month, Open Table listed Joseph By The Sea as one of the most scenic restaurants in America. The section of Maine known as Downeast and Acadia has the distinction of being the eastern-most territory in the United States. It's an area of natural beauty that joins ocean, craggy coastline, and deep forests and streams. If you go to Maine to escape the heat and humidity, its one place you probably want to visit. To the west lies the Kennebec Valley, with the 170-mile Kennebec River slicing through it. Even further west you'll find Maine's Lakes & Mountains region, offering hiking, fishing, biking, camping, and just about any outdoor activity you can think of. The northernmost section of Maine, lying along the Canadian border is Aroostook County, for visitors who really want to get away from it all. It's the largest county east of the Mississippi, larger than Connecticut and Rhode Island combined. There are many different kinds of accommodations, depending on how you plan to spend your time in the state. Those who enjoy the outdoors might want to take use one of the many campgrounds or rent a cabin. If you plan to spend your time exploring quaint towns and poking into interesting shops, one of the many bed and breakfasts might work. If you plan to cover as much of the state as possible, then a hotel or motel might be the easiest accommodation. The official Maine tourism website can connect you with all types of accommodations and attractions. Of course, you don't want to visit Maine and not chow down on a lobster (unless you have a seafood allergy), and there are plenty of places to enjoy one. The folks at MaineToday.com, who live there year round, suggest a lobster shack. "The opporunity to crack one of those puppies open at a lobster shack, while sitting on a picnic table, with the sea sitting idly nearby and two dozen gulls taking turns diving for your fries...well, that's a summer-only sort of experience," the site advises. Portland International Airport is served by a large number of airlines for a small airport. Domestic airlines include Alaska Air, American, Delta, Frontier, Hawaiian, JetBlue, Southwest, Spirit, United, and Virgin America. Boston's Logan International has more flights, of course, and is located 114 miles south of Portland, with all of those airlines, plus more. By ground, destinations within Maine are reachable via I-95.